Inspired by my early Teddy Bear Coaster crochet pattern, 5 more friends were born! Meet the bunny rabbit, dog, duck, elephant and turtle. All are friendly as can be and are more than willing to hold your cup so that your table doesn’t get messy. Crochet them for kids to love and also for the adults who cannot deny how cute they truly are. This pattern set is now available in the Crochet Spot Store (free to download for all Premium Pattern Members). By purchasing this pattern, you will be helping to fund Crochet Spot in making all the tutorials and patterns that you enjoy on this site. Thanks in advance for all your support!! Visit the Crochet Spot Store to purchase or become a Premium Pattern Member. If you need help crocheting these adorable coasters, let me know and I’ll be glad to help! This entry was posted on Friday, July 31st, 2009 at 1:08 PM by Rachel Choi	and is filed under Best Crochet Patterns. You can follow any responses to this entry through the RSS 2.0 feed. You can leave a response, or trackback from your own site. These are adorable, Rachel. I have a question though – what does Amigurumi mean? Thanks Sarah! Amigurumi derives from the Japanese art form of crochet/knitting stuffed toys. These are like stuffed toys but coasters. So I guess you can call them coaster toys, lol. That is the cutest thing I have seen in a long time! You have so much imagination – wow! I think I’ve downloaded way more than $10 worth as premium pattern member! Those are REALLY cute, Rachel. Your patterns are working on me. Feeling the urge to sign up to be a premium pattern member. Thanks so much, Rachel. I love your website and have actually finished some of your cute projects. I really appreciate your talent. I’m always so happy to see your emails in my inbox. These coasters are a helpful way to get kids to actually use coasters. Thanks for all the wonderful patterns! You are very blessed with your talent. I made the teddy bear coaster and sent you a picture with my coffee mug Remember? Well just wanted to let you know that I started laughing when I read that 5 more friends were born! You really have a nice sense of humor. They are all so cute especially the elephant and I love the color you lavender you made the elephant instead of the boring gray. Damn Cute & lovely coasters. I am trying my hands on it too…. Hi Rachel, I have to say this is a great site. Love the felted purses. As soon as I finish the coasters, I’m doing the Casual Girl 2 in black and red for me. What yarn do you suggest for the coasters? Cotton or acrylic? Either cotton or acrylic will work just fine. Cotton is known to be more absorbent though. I can’t wait to try these coasters. They are so cute! Thank you! 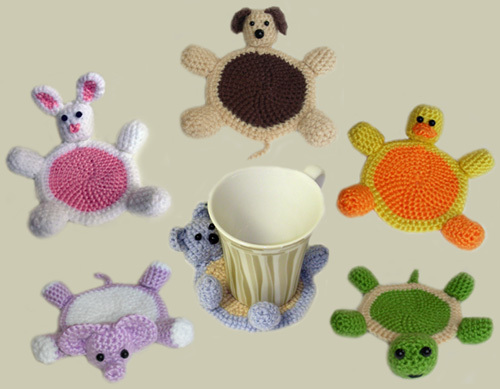 I can’t wait to make your bear and turtle coasters, also your finger puppets. I need to finish some other things first. I am going to try to follow your advice about not having WIP’s laying around, by finishing what I start. They have really been a bad habit and a problem for me because they seem to nag at me. Thanks for your excellent site. I crochet very slowly, rip out a lot, but I hang in there with people like you encouraging and inspiring me. these would make great toys for my grandchildren! The coaster toys are really great n I enjoy making them, would like to know which side is up before attaching the limbs, as both sides present different yarn weaving pattern. Hope u r getting me. Your artworks are just awesome n motivated me to try them out. Thank u.
Hi Pallavi, traditionally round 1 would be the right side (facing up), but in the photos I used round 1 as facing down. It really doesn’t matter for this pattern what you choose. It’s completely up to you as to which side you like! My querry is for the teddy coaster. Thank u Rachel, indeed the backside is much better in weaving pattern which confused me, as to which side is at top. Thank u.
Hi Rachel, I just joined the crochet spot and I purchased 3 pattern and I paid with Pen Pal I did not get any of my patterns and I paid for them! Can you help me please! I paid 14.85 holiday Christmas appliques set 1 and set 2 and the cute animal coasters! Please help me! And log into your account using the orange log in box. Once you are logged in you can see the patterns you purchased via the “My Purchased Patterns” tab at the top of the page. Thank you for all your help! I was afraid I lost them! Do they stay there always? Yes, they will be in your account permanently.